Walgreens Boots Alliance said it would take "decisive steps" to reduce costs as part of a company-wide "significant restructuring". The move comes after the chain said it had suffered its "most difficult quarter" since the firm's formation, with UK like-for-like sales down 2.3%. The chain has 2,485 stores across the UK, employing about 56,000 staff. The firm said a store portfolio review was under way across the global business. 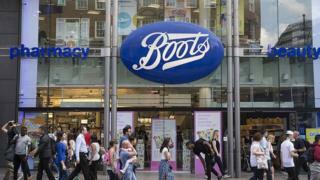 But Boots in the UK said there were no plans for major reductions, adding that it had managed to maintain its market share in the most recent quarter. "We currently do not have a major programme envisaged, but as you'd expect, we always review underperforming stores and seek out opportunities for consolidation," it said. Chief executive Stefano Pessina said market challenges had "accelerated" in the three months to the end of February, but that it had failed to respond rapidly enough "resulting in a disappointing quarter". "We are going to be more aggressive in our response to these rapidly shifting trends," he added. Actions announced include "optimising its store footprint" and increasing its planned annual cost savings from $1bn to $1.5bn. The cost cuts follow Boots' announcement in February that 350 jobs were at risk in its Nottingham head office, amid plans to reduce costs by 20%. Overall earnings for the firm's second quarter were down 14.3% compared to the same period last year. The company said it was now expecting profit to be flat for the full year, down from its earlier guidance of 7% to 12% growth. Maureen Hinton, global retail research director at market research firm GlobalData, said Boots in the UK was struggling to compete with beauty brands such as Charlotte Tilbury, Chanel and Dior which had developed their own stores which offered "a more indulgent and luxury experience". "Boots is quite a commodity place, people go for practicalities such as health and toiletries, but it's not really exploiting trends in beauty. The stores are also looking a bit tired," she added.